Pupils from Coppice School attended an event at the Houses of Parliament, where they taught MP’s and their guests how to code. Apprentices with Birmingham & Solihull Mental Health Foundation Trust shared their experiences with visitors at the Solihull Apprenticeship Show. 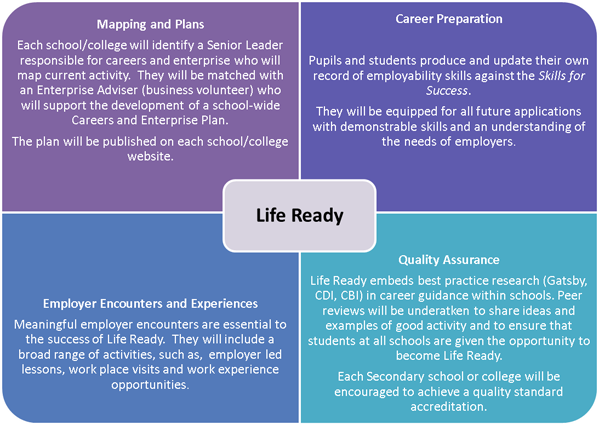 Life Ready has been designed with local Head Teachers and Senior Teaching Staff to support schools and colleges in developing independent, dynamic, young adults and to help raise standards of careers guidance across the borough. Through improved and meaningful engagement with employers it provides young people with the opportunities to progress and record their employability skills, what we call the Skills for Success. It is part of the Careers and Enterprise Company’s Enterprise Adviser Network, which aims to create powerful, lasting connections between local businesses and the schools and colleges in their area.